Facts about Islam. Truth, Sources, Research FIndings. Facts about Islam. Top Sources. What do research findings prove? 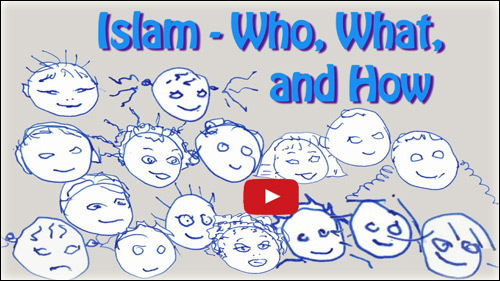 Islam - Who, What and How is a video for kids, and for anyone who isn't sure about, for instance, what are the 3 core parts of Islam, and what is al Walaa wal Baraa? But giving the answers isn't enough. Needed: sources for everything mentioned in the video. There are three essential doctrines of Islam ('usul-ud-deen' - 'essential of the faith'). 3) AL JIHAD & AL HIJRAH. WHO. There is only one god, Allah, and one final messenger, Mohammed. This is the doctrine of Tawheed. Tawheed and Prophethood are considered a dualism. Note: In Islam, a dualism is considered a single doctrine. WHAT. The doctrine of Al Walaa wal Baraa can be seen as Islamic apartheid. It is the doctrine of Allegiance (to Islam and Muslims) and Disavowal (from eveything else and everyone else). There is inequality of and segregation from the non-Islamic. "The doctrine of al Walaa wal Baraa is the REAL IMAGE for the actual practice of this faith." Source: “Al Walaa wal Baraa According to the Aqeedah of the Salaf”, by Sheikh Muhammad Saeed al Qatani, authoritative Saudi Sharia lawyer and imam at the Abu Bakr and Al Furqan Mosques in Mecca. "Allaah has commanded us to obey the Prophet (peace and blessings of Allaah be upon him). "And obey Allaah and the Messenger (Muhammad), and beware (of even coming near to drinking or gambling or Al‑Ansaab, or Al‑Azlaam) and fear Allaah. Then if you turn away, you should know that it is Our Messenger’s duty to convey (the Message) in the clearest way." It was narrated that Anas said: The Prophet (peace and blessings of Allaah be upon him) said: "No one of you truly believes until I am dearer to him than his father, his son, his own self and all the people." It was narrated that ‘Abd-Allaah ibn Hishaam said: We were with the Prophet (peace and blessings of Allaah be upon him) when he was holding the hand of ‘Umar ibn al-Khattaab. ‘Umar said to him: “O Messenger of Allaah, you are dearer to me than everything except my own self.” The Prophet (peace and blessings of Allaah be upon him) said: “No, by the One in Whose hand is my soul, not until I am dearer to you than your own self.” ‘Umar said to him: “Now, by Allaah, you are dearer to me than my own self.” The Prophet (peace and blessings of Allaah be upon him) said: “Now (you are a true believer), O 'Umar." 68. We attach ourselves to every believer from our predecessors back to Adam, and from those of succeeding generations down to those who will fight Ad-Dajjal at the end of time. We love them all whether or not they are known to us, and defend their honour. 69. The followers of Muhammad (Peace be on Him), the first and last of whom comprise one single ummah, the ummah of Islam and iman, are joined together by one aqeedah and one set of laws regardless of their race or country of origin. We love them all and believe that all believers are brothers." Abdullah ibn Abbas said: "Al Muwalaat is the Love in the heart and the total support by the limbs and the tongue for the Deen of Islam exclusively." This rules out the kuffar. Walaa is always to Allah (and the Deen of Islam) exclusively. Al Baraa is from kufr and Shirk. There is no place in the Quran where Muhammad tells Muslims to love people of other religions. By contrast there are at least three dozen verses that tell believers to fight against non-Muslims, and about 500 that speak of their place in Hell. They are from each period in Muhammad's life, scattered across 87 of the Quran's 114 chapters. Koran 3.32: "Allah does not love the disbelievers." Koran 60:4: "We have rejected you, and there has arisen between us and you enmity and hatred, until you believe and worship Allaah alone." Koran 28:86 "Do not support the kafireen in any way." Koran 60:4 “We have rejected you, and there has arisen between us and you enmity and hatred, until you believe and worship Allaah alone." Ibraaheem expressly stated that hatred and animosity are between him and his people (polytheists who opposed the orders of Allah). Regarding this hatred and animosity, he also stated that it shall remain in place, "Until you believe in Allaah alone," and he DID NOT say: until you stop fighting or oppressing us. This refutes those who would say that Ibraaheem’s example is only for those facing non-Muslim oppressors or aggressors. right-click and select "Save As". 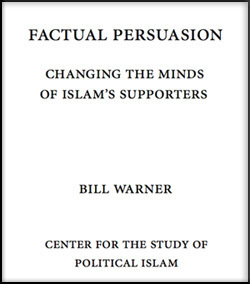 about Islam in 9 pages. Also, Live Freedom - worldwide! Elsa's favorite childhood stories were about people who made it, no matter what the odds. Now she's asking: how do we protect and win back freedoms - like freedom of speech, like the freedom of physical safety, like the freedom to speak the truth and be heard, like freedom from show trials against people who won't be silent in the face of oppression. She has a long history as an achiever: PhD, tenured professor, spoken word performer, author of Think or Sink, blogger. Her message to all: Know more, see more, connect more, achieve more. For kids, age 8 and up. 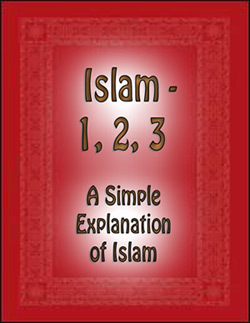 And for adults, to share with anyone who does not understand the essential Islam. The video: fun, easy, clear.